Here in San Diego, we understand that the sun can be draining! 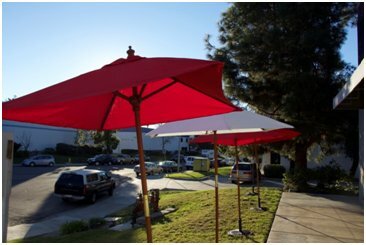 We find that one of the best ways to get out of the deathly rays of heat is with one of our custom made market umbrellas. Not only can you stay cool in the heat - you can advertise your company and get business while doing it! We offer our umbrellas in two different shapes, round or square. The key to any advertisement is to get noticed. What better way than with vivid, full-color Market Umbrellas, with unique personalized designs. There is no compromise in the finish, as these products are printed on high quality fabrics which have high resiliency and durability. 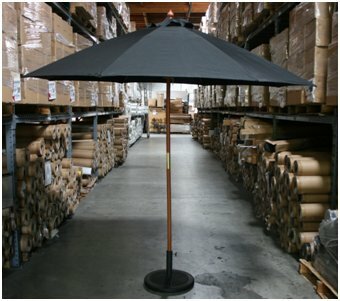 Our Round Umbrellas come in 7 or 9 foot diameter. The pole construction comes in a durable wood or fiberglass. The set up for these poles are very simple, every umbrella comes with a push button locking mechanism. The seven foot umbrella features 6 panels, while our nine foot features 8 panels. The total length from rib to rib is 38"-39" when set up. The center pole is 1.5", which fits perfectly into most umbrella post holes. Our market umbrella design features an extra crown of fabric at the top, called a wind vent. This design allows for a temporary gust of wind to escape from the underneath of the umbrella cover without knocking it over.